Cannot be Normal Summoned/Set. Must be Special Summoned (from your hand) by controlling 2 or more Zombie-Type monsters, and cannot be Special Summoned by other ways. When this card is Special Summoned: Shuffle all other monsters on the field into the Deck, and if you do, this card's ATK becomes 1000 x the number of face-up Zombie-Type monsters shuffled into the Deck this way. This monster is based on the Buddhist folklore creature called hinoguruma (written the same way as kasha but pronounced differently), appearing as a fiery chariot that carts sinners to Hell, making them suffer horribly as it does. Its name comes from the legend of the kasha, a type of yōkai that disturbs funerals and steals unwatched corpses before they can be cremated and drags them off to Hell, sometimes fulfilling the same role as the hinoguruma. In Yu-Gi-Oh! 5D's World Championship 2009: Stardust Accelerator this monster is called Hot Ride. In the English Yu-Gi-Oh! GX Manga, this monster is named Fire Wagon, likely thanks to the literal translation of its Japanese name. This card's text in Legendary Collection 2: The Duel Academy Years Mega Pack was written incorrectly, such that it stated that returning all other monsters on the field into the Deck is a cost. This was corrected in the Duelist League 16 participation cards reprint. If you return face-down Zombie-Type monsters to the Deck they are not counted towards the ATK of "Kasha." If you return Zombie-Type Fusion Monsters or Synchro Monsters to the Extra Deck, they count towards the ATK of "Kasha." If non-Zombie-Type monsters that are treated as Zombies by "Zombie World" are returned to the Deck by "Kasha" they do not count towards its ATK. If "Skill Drain" is activated, the ATK of "Kasha" becomes 0 and stays at 0 even if "Skill Drain" is later removed from the field. The effect of "is the number of Zombie-Type monsters returned to the Deck by this card's effect x 1000." resolves as part of the effect which returns all monsters other than "Kasha" to the Deck. It does not start another Chain. If a non-Zombie-Type monster's Type is changed to "Zombie" by the effect of "DNA Surgery" and is returned to the Deck by the effect of "Kasha", then it is not counted as a Zombie-Type monster being returned to the Deck. The ATK of "Kasha" will be 1000x the number of monsters returned to the Deck whose Types were originally "Zombie". : If monsters which is a Zombie-Type monster because of "DNA Surgery" is returned to the deck by the effect of "Kasha", then what is the ATK of "Kasha"? The ATK of "Kasha" is determined by the number of returned monsters which are Zombie-Type while they are in the Deck. If "Zoma the Spirit" is returned to the Deck, it is not a Zombie-Type monster while in the Deck, so it is not counted. Token Monsters are not returned to the Deck, so they will not be counted. : If "Zoma the Spirit" or a Token Monster is returned to the Deck by the effect of "Kasha", then what is the ATK of "Kasha"? When determining the ATK of "Kasha", Zombie-Type Fusion and Synchro Monsters which are returned to the Extra Deck are also counted. : When the effect of "Kasha" changes its ATK, are monsters returned to the Extra Deck also counted? The ATK of "Kasha" is equal to 1000x the number of face-up Zombie-Type monsters which were returned from the field to the Deck. 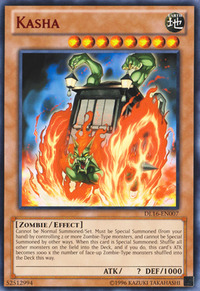 Thus, if a face-down Zombie-Type monster is returned to the Deck, then it is not counted as a Zombie-Type monster being returned to the Deck by the effect of "Kasha". : If a face-down monster is returned to the Deck by the effect of "Kasha", then what is the ATK of "Kasha"?